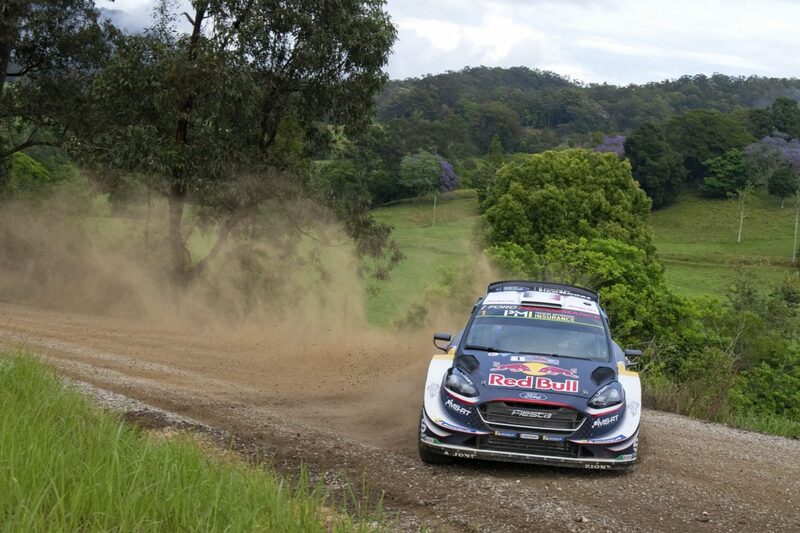 An error from Ott Tanak on the penultimate stage has handed Sebastien Ogier a sixth World Rally Championship crown at Kennards Hire Rally Australia. The Toyota driver slipped off the road in the second pass through the Sapphire stage that caused trouble for a number of rivals due to treacherous wet conditions. Tanak was unable to recover the car forcing him out of the rally. The Estonian needed to win the event and the final Wedding Bells Power Stage, and hope Ogier hit trouble to prevent the Frenchman from winning a sixth title. Fellow title rival Thierry Neuville (Hyundai) retired from the previous stage when he clipped a tree, damaging his rear suspension ending his faint championship hopes. Ogier, who had been cruising knowing he only needed to finish the event to claim the title, will now be able to enjoy the final stage. It will prove to be an emotional end to the rally with this year’s season finale his last drive for the M-Sport before he moves to Citroen next year. Toyota’s Jari-Matti Latvala leads New Zealand’s Hayden Paddon by 32.1s heading into the final stage.